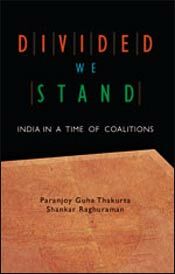 New Delhi: 11th January, 2008: The occasion was release of the revised version of a book ‘Divided We Stand’. Revised version? Yes. But, why? To this, there was no valid justification – neither from the authors nor by the publisher. Instead, they had mechanical smile on their faces. Couldn’t the authors – Paranjoy Guha Thakurta and Shankar Raghuraman – find a new subject for another joint work? Both are senior journalists and certainly have much to do instead of riveting their own work, which had been earlier published in 2004. Lo, the authors had also organized a panel discussion on coalition politics immediately after the book release. And look who they had invited. There were Congress’ Jaipal Reddy, BJP’s Arun Jaitley and CPI(M)’s Sitaram Yechury. There was no answer to my query as to why leaders of smaller parties and those in coalitions at the Centre and State levels not invited. Further, it was sad to find eminent author and global leader Shashi Tharoor sitting among the audience. He was sitted next to me, though he ought to have been on the podium. He could have opened many eyes. In fact, I had gone to attend the panel discussion to enhance my knowledge on coalition politics. But Congress and Co. seemed busy writing obituaries on coalition politics. What authority Congress’ Reddy or BJP’s Jaitley have to predict that “coalitions will not survive for long.” They did say that. “They may be there for sometime…about five to ten years…till national parties are able to revive their dominance,” Reddy asserted, without having any idea as to how long his own Congress is going to survive as a dominant political party. If Reddy didn’t have any clue as to how many states his Congress ruled, he should have limited his discourse to merely congratulating the authors for their efforts than speaking on a subject he looked too frail to dwell upon. Then, Yechury, too small a match for Reddy and Jaitley, kept shivering all through the function. Thanks to the icy wind. The rostrum was shivering too, so were the mineral water bottles, as Yechury shaked his legs vigorously down under. Only if his outfit CPI(M) could shake the Manmohan Singh-led coalition government at the Centre in the like manner!!! Final Words: (1) The topic of the book is impressive; (2) Caste-based, religion-based and region-based parties are going to stay for years to come. And why not? Castes have been ignored, religions disregarded and regions overlooked, far too long by successive governments. Next Wanna Participate In BBC Documentary! har vistar apni sima mein hota hai. sima apne vistar ke karan hi akkar grahan karti hai. jatiwad se lekar waktiwad tak, aur un simao me bati rajniti ko ane wala samay ek nay akkar aur manak mein sametega. Coalitions in India will stay. Coalitions will stay until dynastic politics thrive here. Even if the likes of Mr.Narendra Modi (Gujarat) and Ms.Mayawati (Uttar Pradesh) manage to form government of their own, Centre Politics is an altogether a different game. So many aspirations, so many ideologies cannot be accomodated in one or two political parties. In any case, Gujarat and Uttar Pradesh results are exceptions of the time. I wish the authors relaunch the re-revised version of their book and could rope in representatives of all major political parties and present a livelier debate on the topic.